Do you feel responsible for the well-being of the environment? If yes, then there is a strong likelihood that you will favour GreenGeeks as your host provider for your website or blog, because, as the name suggests, GreenGeeks claims to be an environmentally responsible web hosting provider. Apart from the usual hosting features, their unique selling proposition is the fact that they put three times the energy that you consume back into the grid through wind energy (300% carbon offsetting) and ensure that you have a negative carbon footprint (which is a rare achievement for any web host). This top quality green energy hosting service is bound to make you feel really good that you are not harming the environment in any manner. To top it all off, being a relatively new hosting service provider, they have already made good progress in establishing themselves as a reliable name within the web hosting industry. So, in this article, we will look at the detailed features provided by GreenGeeks, the different hosting plans as well as the advantages and disadvantages. It was launched in 2008 and has served more than 35,000 customers (from over 150 countries) by hosting more than 300,000 websites and is based in Los Angeles, California. GreenGeeks has also established itself as the industry’s leading green energy web hosting provider. Despite being relatively new, this web host manages to provide reliable customer service to you at affordable prices, because of the tremendous experience (around 40 years) of its management team with regard to web hosting. The founder and CEO is Trey Gardner, who has significant exposure to web hosting. It has been a Better Business Bureau (BBB) accredited business since 2009, which means they are committed toward the resolution of customer complaints, if any. The most important feature offered by GreenGeeks is the possibility of a positive carbon footprint on the environment, as they replace three times the amount of energy your website will utilise with wind power credits. It is leading the green revolution in the web hosting world, which is why many other hosting companies have tried to adopt a green approach in recent years. Let’s now take a closer look at the various other features offered by the GreenGeeks web hosting service provider. As is the case with most hosting providers, the GreenGeeks team focuses more on preventing any server downtimes or failures. Their uptime percentage is about 99.9%, which is the industry standard these days and quite good. They use the best breed of server hardware which is pretty robust and is a world-class data facility. Also, they purposely keep a low number of websites hosted on a server to ensure better server access speed and a solid performance by hosted sites at all times. This strategy combined with their proactive or reactive service monitoring ensures significantly higher efficiency of the servers. What is heartening is the fact that even if there is any unfortunate non-recoverable hardware failure, the GreenGeeks support team is able to get your site up and running again very quickly and efficiently, because they perform nightly backups. This is a major reason for their high uptime percentage. GreenGeeks has multiple data centres in different countries, like the U.S. (two), Canada (one) and the Netherlands (one). These strategically planned locations for the data centres ensure that you can opt for the data centre that is closest to your targeted visitors. This leads to significantly improved and faster performance for your website. As part of their well-planned infrastructure powered with 300% clean renewable energy, the GreenGeeks data centres have raised floors, climate control, around the clock security, fire suppression systems, UPSs, water detection systems as well as generators to ensure that your website and hosting data is absolutely secure. With your hosting account, you also get secure IMAP or POP3 email accounts. So, you don’t need to worry about the security of information shared via your emails. Since GreenGeeks has not been around as long as many other big names in the website hosting industry, it is apparent that they see it as important to impress their customers with their dedicated customer service. Their support team is friendly and patient enough to assist absolute novices as well as those who are highly skilled and to interact with tech-savvy webmasters and get their hosting issues resolved. They do not outsource their support to save costs and thus ensure customers don’t leave. The entire support team of GreenGeeks is in-house and spread across North America. You can take advantage of their support anytime via Live Chat or emails. Their phone support is available from 9 am EST to Midnight EST (Mondays to Fridays) and from 9 am EST to 8 pm EST (Saturdays and Sundays). The response time is pretty quick and if there is a complex problem, they will inform you about the extensive research required and get back to you with a resolution of the problem after a while. It offers you with the industry standard and user-friendly cPanel, which can be used for easy DNS management and monitoring of your website statistics. It is good to see GreenGeeks stick to this already known control panel and do not experiment with any custom version of cPanel, as it makes it easier for most webmasters having other hosting accounts to navigate through the cPanel. 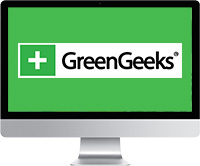 So, if you have handled any cPanel before, the control panel of GreenGeeks is exactly the same and you won’t have to refer to some help documentation to start using it. Your cPanel is also equipped with one-click installations for popular scripts like WordPress and Drupal. They win customers over by offering a 30-day money back guarantee of their services. If you do not feel satisfied with them within this period, you are entitled to receive the full refund. This Ecosite Starter plan is comprehensive for all your basic hosting requirements. It is available at $9.95 per month (monthly subscription), $6.36 per month (one-year subscription), $5.56 per month (two-year subscription) or $3.96 per month (three-year subscription). Free tools for site building, SEO, marketing, etc. All the GreenGeeks VPS hosting plans come equipped with a cPanel or WHM License, a free eNom domain reseller account (to register, transfer and manage domain names as well as sell SSL certificates, WHOIS ID Protect, etc. ), the free nightly backup and migration service, the CSF Firewall, LFD, Mod Security and many other Apache configurations as well as PHP or MySQL optimisations built in. All the GreenGeeks dedicated server plans make use of server-grade Intel processors, hard drives, memory and equipment. The GreenGeeks official website requests that you get in touch with their sales team at 1-877-326-7483 to make the right choice with regard to the dedicated server hosting plans. GreenGeeks offers you 100% white label hosting platforms, which give your brand logo to the control panel, utilise private name servers and more, with their reseller hosting plans. A key factor in favour of GreenGeeks is that they don’t charge anything for setting up or migrating your domain, thereby allowing you to get your hosting needs fulfilled within an affordable budget. They offer unlimited web space, data transfer, bandwidth and domains. Everyone expects their website to grow and such unlimited features help their customers to take care of their site expansion needs well in advance. GreenGeeks will allow you to contribute your bit to the environment with your hosted website being powered by 300% wind energy, leading to a negative carbon footprint. This is a huge advantage. You can get your new GreenGeeks account setup activated pretty quickly. So, if you are in a hurry to get your hosting needs sorted out, this host helps you achieve that in a very efficient manner. It not only makes it easy for you to install WordPress with the one-click option, but also helps you to understand how to use the WordPress platform effectively. With WordPress hosting being on the rise in recent years, you may want to host a WordPress site sooner rather than later. It offers only Linux-based hosting and does not cater to your Windows-based hosting requirements. The phone support team of GreenGeeks is not available around the clock, while its Live Chat and email support are. So, if you are one of those who like to talk about the issue as soon as it occurs, you may find yourself waiting if it happens outside the hours that the phone support team works. GreenGeeks offers only one type of shared hosting (web hosting) plan with no possibility to upgrade. Having discussed every feature offered by GreenGeeks, you will realise that it has a lot to offer apart from the obvious benefit of using a clean renewable energy hosting service provider. There are plenty of plans offered to cater to your different hosting needs and their prices are pretty competitive. Also, the fact that there are hardly any additional costs involved makes us like GreenGeeks even more. You can always take advantage of their 30-day money back guarantee if you are not satisfied with their services. So, what are you waiting for? Go ahead and try it out!